A wonderful table discussion between Tom Ascol and Tom Nettles (I care not to use honorific titles for brothers in Christ) about how the SBC was formed, where it ran off the rails, what the obstacles are, and how we negotiate the way forward. I do not see conventions and denominations in the Scripture, but these men give me some hope for life within the SBC. Hippety-hop, There Goes Peter Rabbit! Have you ever seen this scenario take place? A good friend calls you to tell you that they are struggling with their current church and wants your advice on how to work things out. Your heart sinks as you realize that what he or she is wanting is not what they are asking for. The first or second time the phone call took place, you may have encouraged them to speak with the pastors or elders to try to work out any differences or resolve any issues. Now, the real reason they are calling you is not to seek your help and guidance in seeing relationships restored. What they really want is for you to say that it is acceptable for them to don their Peter Rabbit suit and hop to the next church that might or might not make them happy. 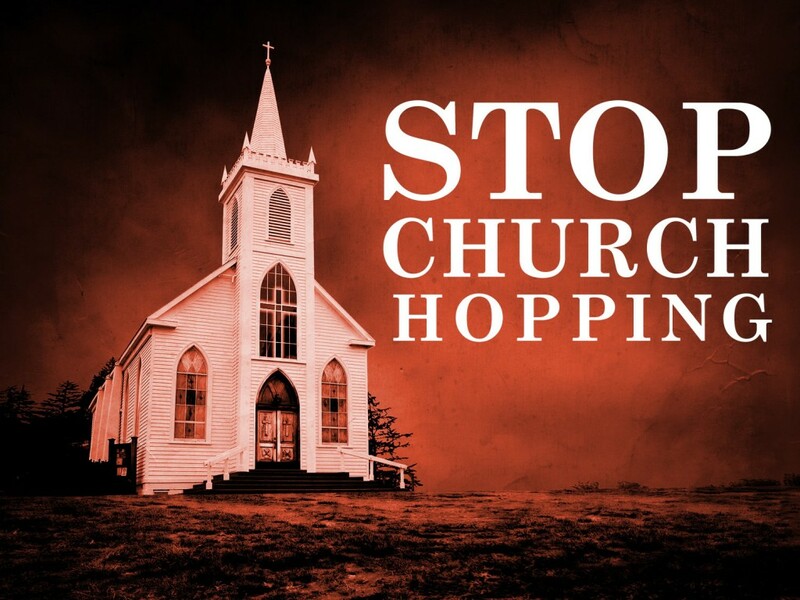 Sadly, hopping from church to church often becomes the normal pattern for many Christians. Instead of considering what may be wrong in their own life, the fault is always placed at the feet of the church that they used to attend. 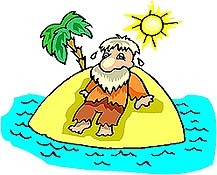 The sad reality is that even if they were to attend by themselves, like the old man on the deserted island, they would eventually find a reason to leave. I have long contended that the reason people go to a church is more times than not the very reason why they will leave. As an example, if you go to a church because they have a great music program, when that ministry fails or begins to struggle, you will look for another church. The same is true if you go because of the programs or all the ministries designed to keep your children happy and entertained. If the really hip, cool, relevant youth leader leaves and the youth group dries up, you will soon be on the search for a new place to worship. For the record, I am not discounting leaving a church because the church refuses to address sin, or because of a change in teaching to a doctrinal position that is clearly not in line with Scripture. I am speaking about the plague that has infiltrated churches to the point where members are switching from one church to another faster than they switch fitness clubs or switch from the latest diet to the next. Now as honesty is the best policy, I am afraid that in the beginning of our marriage, I was there. We hopped so many times that I had a custom-made Peter Rabbit suit that I would wear before I even attended the first service. While I was ensuring that my family was with me, I was certainly not being a spiritual leader. The normal routine was to schedule an appointment with the pastor. In that meeting, I would grill him on the usual “important” issues like the KJV Bible, or if they used CCM in their services, whether they had adequate programs to babysit my children when my wife and I wanted a break, etc., etc., etc. Yes, I remember playing the spiritual card of “We just want a place where we can serve and where our family can be fed!” That would normally score points with the pastor and his wife. However, it may have been a week later, month later, or even a year later, we would become discontented with something that was being done and we would “miss” a Sunday to see if somebody came to visit or to call us. Eventually, my standard phrase became, “Well, I think we should be looking for a new church because we are not getting fed at this church! What do YOU think, Sweetheart?” That was always a good indicator for me as to whether she was unhappy with the church as much as I was or whether I was just looking for an excuse to leave so we would not have to become too committed. But the truth is that until I was willing to find a place that was first and foremost doctrinally sound, the rest of what we were looking for was actually irrelevant. Further, when we found a place where doctrine was the focus along with expositional ministry of the Word, I should have been thankful that somebody cared enough to feed my soul and my family as we worshiped together. However, this was rarely the case because doctrine was not as important to me as I thought it was or as I pretended it to be. You see, if doctrine was really important, THAT would have been the reason why I remained instead of looking for another excuse to run to the next place. So instead of focusing on learning and how I could be a blessing to others, I simply became Peter Rabbit again and laid the blame for the next hop on the previous pastor or church we were attending. However, this plague that is devastating to churches is a problem that occurs for two main reasons. It is often these two reasons or a closely related one as to why I and others like me would have hopped from church to church, or even why you or somebody you know is still getting plenty of usage out of their Peter Rabbit outfit. First, pastors and elders have made it too easy to be part of their social club. Having been there as a pastor, I can recall how great it felt to finally get some visitors to come in to service. Of course, in our desire to see them back again, we would invite them to lunch to get to know them. While there is nothing wrong with taking guests home for Sunday lunch, there were times when during the conversation I would be listening to all the things they would tell me they had done in their previous church and how eager they were to find a church where…yep, you guessed it…where as they would put it, “We just want a place where we can serve and where our family can be fed!” Hmmmmm, where had I heard that before? My problem was that I was focusing on numbers instead of disciple-making. What I should have been asking was WHY were they leaving their previous church? Was it a doctrinal difference or was this another church hop? Then, I could have clarified WHAT kind of doctrinal difference would cause them to initiate an upheaval in their family and leave their local fellowship behind. When it got to the point where they were expressing an interest right at the beginning, I should have taken the time to contact my fellow brother and colleague to verify there were no hidden issues. The problem would become compounded if there were issues or if the family was not leaving their previous church due to moral or doctrinal problems, and by accepting them into our assembly, we were choosing to overlook the issues hoping that our church would be the catalyst that might throw them into a better relationship with God. Sometimes that does happen, but I am afraid that accepting problems from one church is only going to add to the problems that already exist in your own ministry. By accepting the problems when a person is leaving for an unbiblical reason, we have not helped that previous church or pastor, nor have we helped the family looking to join, nor have we helped our own church. Now I recognize that not all leavings fit into this category, but I have found that many do. It is hurtful and does not portray a unity within the body of Christ to those who watch us from the world. Today, my ministry is different and I hope there are a few areas in which I have grown considerably. Numbers are not so important any more and I try to be content with those whom God has placed in front of me each week at each meeting that I have the privilege of opening His Word. When I speak with a person now, I want to know the answers to those hard questions that I should have been asked and that I should have asked in prior ministries. And if our assembly accepts somebody into the fellowship, my prayer is that it will be for the right reasons and that they will be coming for the right reasons. I do not offer programs with the hopes that more will come and I have no desire to present people for acceptance if they look like they are hopping to avoid problems that they refuse to address either in their own lives or that might just be a minor difference or even based on a personality conflict. I do ask them if they have sat down with the leadership at their previous church and spoken about their concerns. If they have not, I do tell them that I will contact the leadership to see if we have their blessing to work with the family and if there are any concerns of which we need to be aware. As a little side note, there is something to be said for the “letters of commendation” given from one church to another as mentioned in 1 Corinthians 16. I am NOT talking about the little postcard sent when people transfer their membership by letter either. But that should probably be a post for another day. Now on to the second problem for the plague of church-hopping and it is fairly simple. Members today have little to no commitment for the hard things of God or His Word. As long as they do not have to be committed, nor are expected to be committed, they will continue donning the Peter Rabbit suit as often as it suits their whims or desire for the latest and greatest programs racing the church circuits. Commitment seems to be a dirty word in many circles. It requires that we give up our pet foibles and whims in an honest desire to share fellowship with brethren around what is important. What is important is what is clearly stated in Scripture, and not the latest battles raging today over minor issues like Bible versions, style of music, or a whole host of other concerns that are separating brethren that are not worth the fight and only make us look foolish to the watching world. To conclude, my encouragement to fellow pastors and elders is to be careful who we consider allowing into our midst. Sometimes wolves start off looking like nice fluffy little pups. We are to guard our flocks in our calling as overseers and this will require taking a more proactive stance on dealing with issues like the perennial Peter Rabbits. Brothers, we are not islands to ourselves and should be working to fellowship with others who are like or simmilarly minded in doctrine and teaching. Our churches profit little if all we are doing is growing by sheep-stealing. 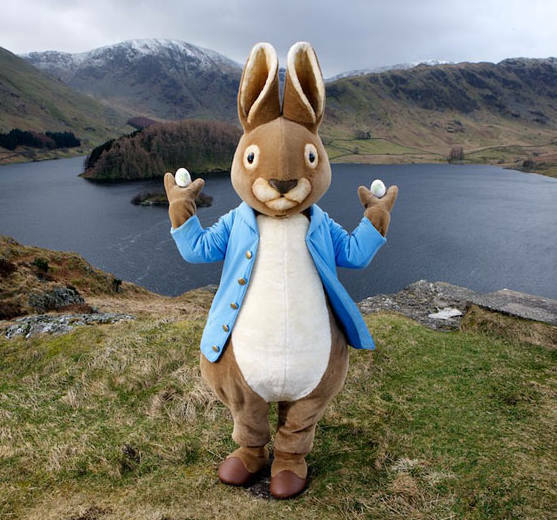 And, to my fellow brothers and sisters, from past personal experience, the Peter Rabbit suit is not all that it is cracked up to be. It is uncomfortable to wear for you and your family and to those you keep leaving behind. Wearing the suit will normally only serve to get you all hot and bothered. Then you will end up looking for fellowship in all the wrong places and for all the wrong reasons. It is time that we take the suits off and don’t bother hanging them back up in the closet to wear another day. It is time they were destroyed and that we started seeing commitment to God and His Word, and to have a heart to deal with the problems as they arise.